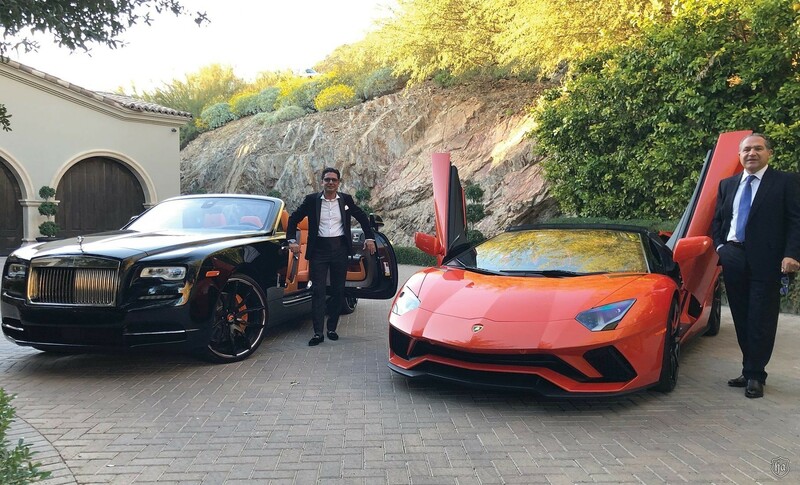 Drive your cars to paradise; park them in a ballroom worthy of their provenance. In 85253, one of the country’s most prestigious zipcodes, this 20,000-square-foot estate elegantly built on 1.21 acres along the south side of landmark Mummy Mountain in Paradise Valley. 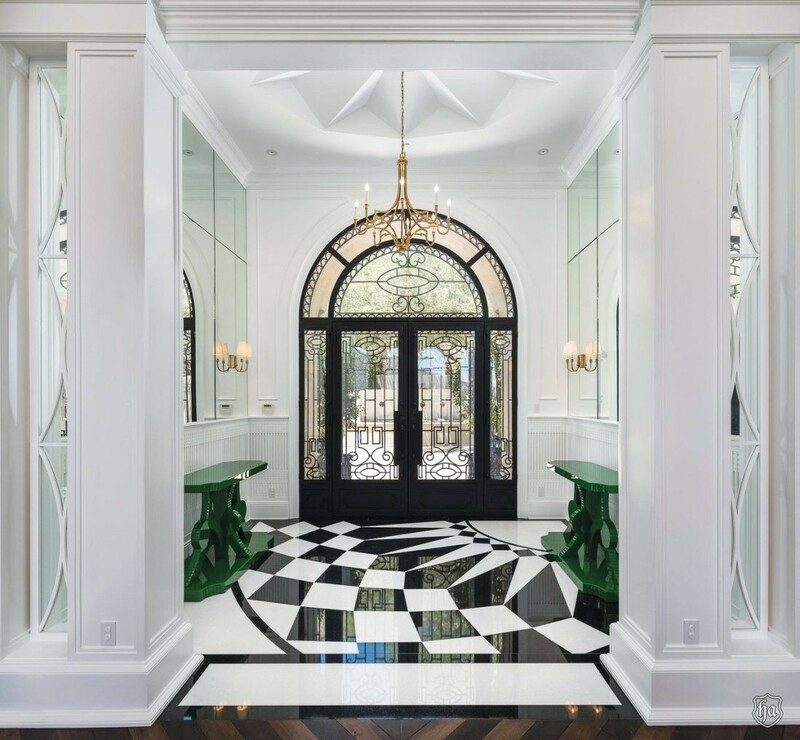 The classic European-Style custom home, 7046 North 59th Place, features six bedrooms, six full bathrooms and six-and-a-half half bathrooms on three well-defined levels. 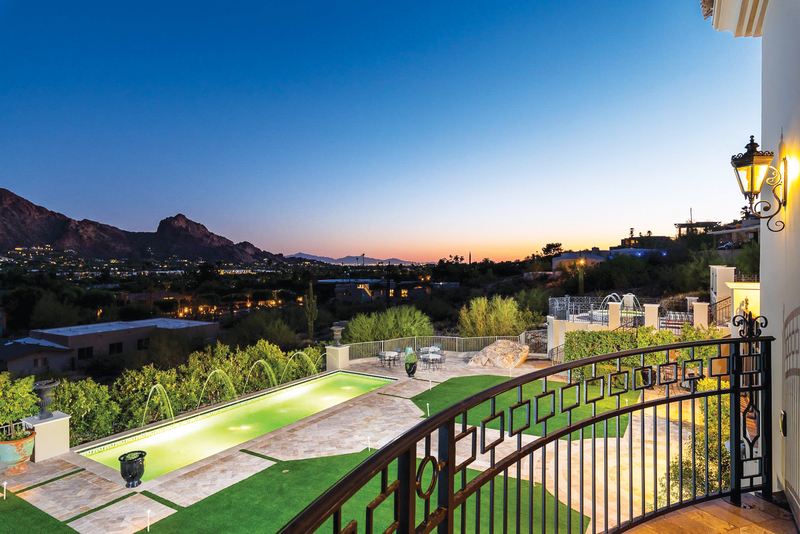 The 1,500-square-foot upper level, including the office and guest rooms, the 10,000-square-foot main living area, and the 8,500-square foot lower ballroom and car showroom, all provide 180-degree views, magnificently centered on another Valley of the Sun landmark, Camelback Mountain. “The home was slightly tilted on the lot to highlight the mountain,” one of the owners explains. “The view is the highlight in a house of many highlights. Every room has a stunning view. Inside and out, this is a home for someone who appreciates beauty.” She and her husband acquired Bella Paradiso in 2011, finishing it three years later. The 8,500-square-foot ballroom flexes as a showplace for banquets, business meetings, charity events – and your collection of exquisite vehicles. More than 200 guests can be accommodated or 20 cars displayed. Window walls open to an expansive lawn and custom-tiled patio area. A large Jacuzzi is just outside, and, below this, at the bottom of the descent and overlooking the hillside, is the heated pool. Among the home’s many bespoke details are hand-painted tiles lining both features by the distinguished Sicilian sculptor, Sergio Furnari. Although the private and public areas of the home are connected, they function independently. The family level offers luxurious features such as arches, pilasters, custom window glasswork and ironwork and a television that drops from the ceiling and reascends when not in use, allowing the colorful wall art to maintain its prominence. The lower ballroom is connected by elevator to the overheight six-car garage at the motor court on the main street level. From here, your cars can be lowered to the ballroom or raised to drive or transport for service, concours, rallies, museum showings, auctions and other automotive events. This also serves as a lift to accommodate catering needs. “We entertain on a regular basis, and many of these events are large charity functions,” she explains, noting that the ballroom has a separate street-level entrance, so guests do not enter the main living area. One of the connections between the two floors is a clear glass table handcrafted in Murano, Italy, the city near Venice known for its glassmaking. 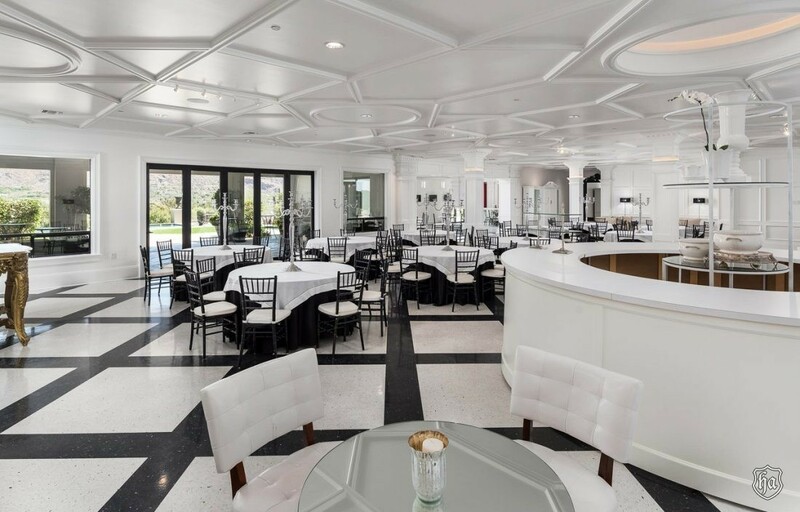 Just inside the main-level, the table serves as a large oculus through which a prized Ferrari, Bugatti, Corvette or Cobra can be showcased or a meticulously set banquet table. 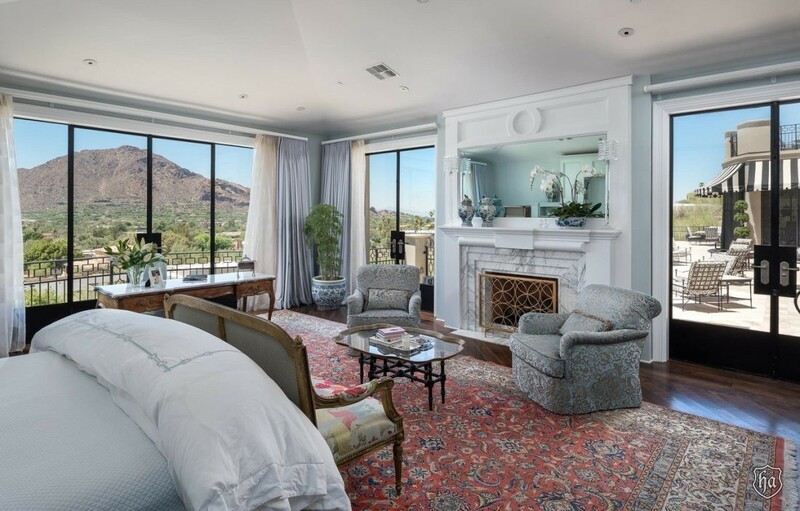 “When you place your signature collections in this ballroom and offer panoramic views, too, you’ll raise eyebrows, even in the most discerning crowd,” says Frank Aazami, principal of the Private Client Group for Russ Lyon Sotheby’s International Realty, Scottsdale. LifeAmong the stellar properties available in exclusive Paradise Valley, Bella Paradiso is still extraordinary –– combining premium location, architectural and interior elegance, abundant lateral living spaces, exceptional craftsmanship and finishes and fabulous mountain and city lights views. Unashamedly luxurious and cosmopolitan for the finest black tie events, yet intimate for family livability and comfort, this is five-star resort living brought home. 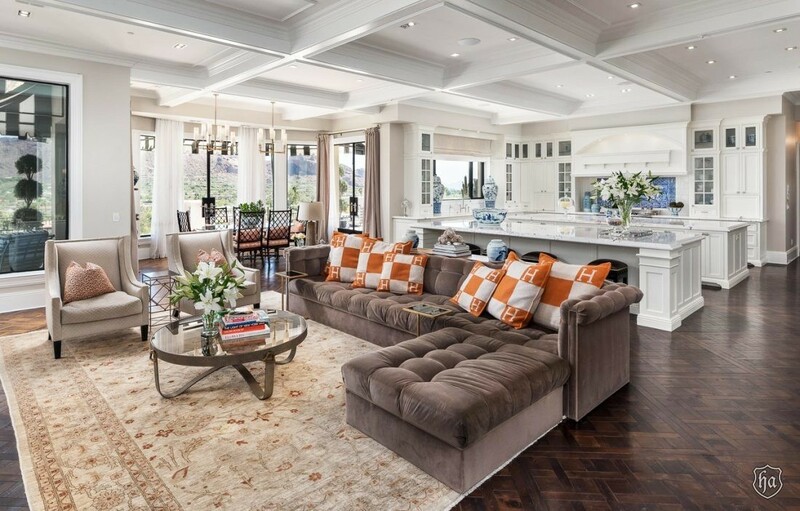 European without being gaudy, the home showcases fine woodworking and materials such as extensive marble, says the owner, who collaborated with Herzlinger to incorporate the couple’s wide travel experience into the design. 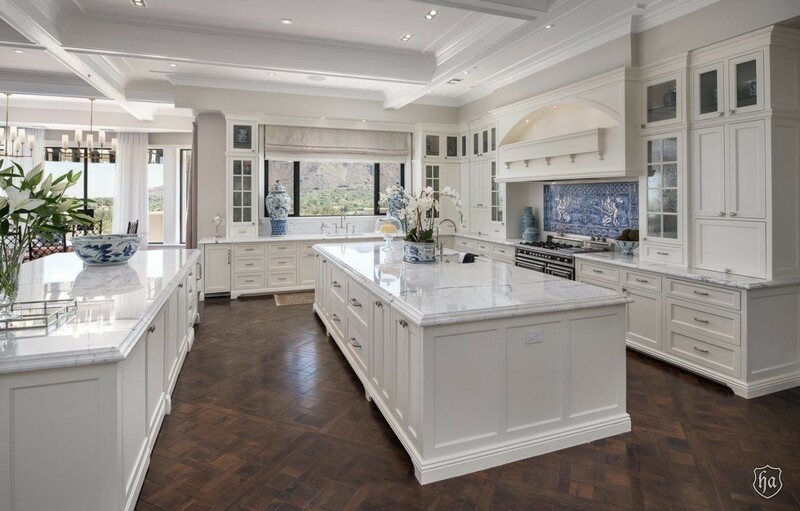 So well does the sink window in the kitchen frame Camelback Mountain that you’ll think the mountain was made for the mansion. Entertainment focused, the room has two islands finished with imported marble. And, a butler’s pantry ensures generous provisions for your guests. The master retreat celebrates this description, with a private sitting room and luxurious bathroom suite. Here, the TV, for example, is embedded in her vanity mirror. The home’s game room also features this. This extraordinary one-of-its-kind home is offered for $22,888,000. For more information and a video, see pcgsir.com and PrivateClientGroupAgents.com. 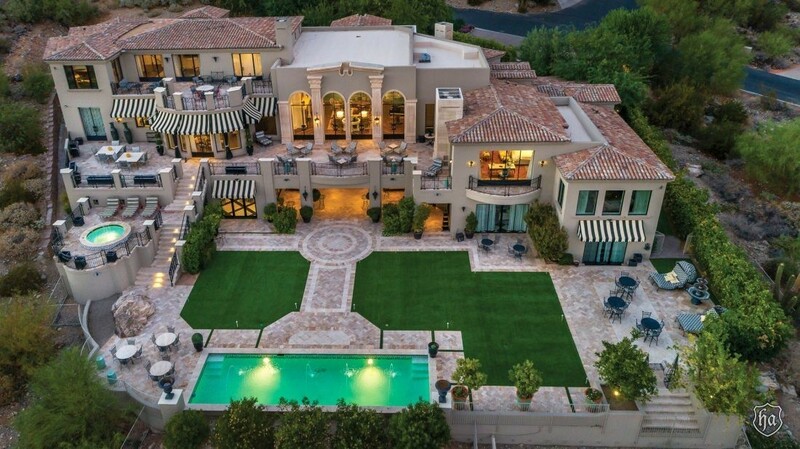 To visit Bella Paradiso, call Frank Aazami, principal of the Private Client Group, Russ Lyon Sotheby’s International, Scottsdale, 480.266.0240 or frank@pcgagents.com, or his associate, Jean-Michel Edery.SA, office, 480.287.5200, and cell, 480.747.4795, and jm@pcgAgents.com.